The original recipe for absinth was created in Switzerland in the middle of the 18th century. Somewhat more than a hundred years later, consumption of absinth was widespread in many European countries. At the end of the 19th century, more absinth was consumed per person in France than wine! The main component of absinth is wormwood. In high doses, the thujone it contains causes dizziness, hallucinations and delusions. Reports alleging that these and similar effects also occur with (excessive) absinth consumption have subsequently turned out to be false, as they were attributable to conventional, long-term alcohol abuse and poor quality alcohol. In all events, a politically-motivated ban was imposed in France in the 1910s based on this fake news, as ultimately in France as a wine country there was no way wine consumption should decline because of absinth. In the following years, this ban was also imposed in almost all other countries. Only towards the end of the 20th century and during the 2000s were these bans gradually removed, not least because absinth was hardly known to anyone in the population. Today, absinth is available legally once again in Europe and North America provided a certain concentration of thujone is not exceeded in the beverage. The original absinth made the Swiss way is clear and colorless. For this, the plant mixture is distilled as a spirit (vapor infusion). Similarly to Ouzo or Pernod, the mixture also becomes milky if water is added to the absinth before consumption. Despite its high alcohol content (up to approximately 80% ABV), French or Bohemian absinth is more comparable to a liqueur. Its taste is very sweet and the herbs/spices were usually macerated and not distilled, or only partly. 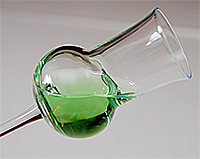 Such types of absinth also have the familiar green color, which explains the name “green fairy”. However, this is often helped along by using food dye, because infused spirits with herbs normally become brown and not green. By adding a certain mixture of herbs to the distillate for a short amount of time, however, it is possible to make a “green fairy” yourself in a natural way. It goes without saying that absinth will also be made as part of our seminars and courses. If you would like more detailed information in the seminar about the production, possible compositions of the herbs and so on, then please mention absinth in the comments when registering for the seminar. Are you looking for distilling equipment or stills for making absinth? The Piccolo or Vetro stills are suitable above all for absinth makers who like to experiment. A distillation process takes 20-30 minutes, so you can try many experiments in a short time and with only a small amount of materials. The distillation will yield around 200 ml of absinth. If you would like to distil larger quantities of absinth, then the Classic or Deluxe still would be the right choice for you. You also need a graduated cylinder and the hydrometer to dilute the distillate. Basic equipment for making and experimenting with different absinth recipes. Basic equipment for making and experimenting with your own gin recipes.